An exhilarating conversion story of a devout Baptist who relates how he overcame his hostility to the Catholic Church by a combination of serious Bible study and vast research of the writings of the early Church Fathers. 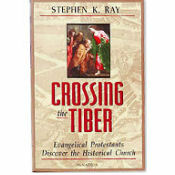 In addition to a moving account of their conversion that caused Ray and his wife to "cross the Tiber" to Rome, he offers an in-depth treatment of Baptism and the Eucharist in Scripture and the ancient Church. Thoroughly documented with hundreds of footnotes, this contains perhaps the most complete compilation of biblical and patristic quotations and commentary available on Baptism and the Eucharist, as well as a detailed analysis of Sola Scriptura and Tradition.